Just like any all-purpose knives, the best kitchen knives have to be sharp, comfortable to use, and tough. But unlike a regular kitchen knife, steak knives must look good beside the plate and while in use. From its stylish ergonomic handle to its hollow-ground edges and large serations, these steak knives are designed to saw through meats well repeatedly. A full tang knife extends the full length of the knife-from tip to grip, as they say. It is commonly known to be the sturdier than the alternative, partial tangs. Steak knives like this set that are full tang are not only strong but typically have a visually appealing look over partial tangs that you company will admire. 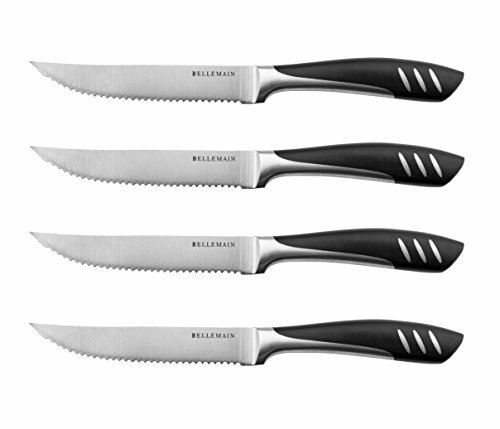 Like all Bellemain products, the Bellemain steak knife set is constructed with hard wearing, long lasting materials that will stand up to anything. So go ahead, do your worst, and if you find you are not happy with them for any reason, return it for a full refund. *Supplies are limited. Secure your order now to ensure availability. Order Your Steak Knife Set Today By Scrolling Up And Clicking "Add To Cart" Now! A STEAK KNIFE THAT LOOKS AND FEELS GOOD IN ALL CONDITIONS: Your steak knife deserves to look as good as it cuts-and it has to cut really well. Designed ergonomically and specifically for steak-eaters, these steak knives also add a touch of elegance to any special meal. THE STAND-OUT ADVANTAGE OF "FULL TANG": While many inexpensive knives are two or more pieces pinned together, a full-tang knife is one solid piece and provides the most strength and durability. WE PROVIDE THE BEST BUY-BACK GUARANTEE IN THE BUSINESS: We are certain you will enjoy your premium Bellemain steak knife set for years to come. However, everybody makes mistakes. And if you think we made one, or you no longer feel it's right for you for any reason, we'll buy it back from you risk-free.